Fragments of good rowing material peek through this otherwise bloated fusion of pop philosophy and inspirational drivel from Lambert (an editor at Harvard magazine). In this memoir, Lambert recounts that he was branded a “brain” in his youth, thus effectively eliminated from the sporting life. Then, at Harvard, he briefly dabbled in rowing before giving it up: too many winter hours in the dark tank room convinced him to stick to academics. Then later, after graduation and various locational and vocational moves, he returned to Boston and to the sport. He continues to row, though he is better known for his writings on the sport, which have a nice rhythm of their own and a wicked way with describing the torturous pain involved. This book shows patches of that flair, but they are tethered to a profusion of banalities that are meant to inspire and instruct. Life as a battle against headwinds is typical of his painful analogies. 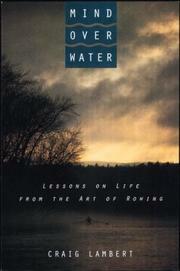 Other groaners include: “mistakes are not failures; they are results that diverge from our expectations”; “a steersman takes charge of life’s course”; and “lessons learned afloat carry over onto dry land, where we also want maximal forward motion in our lives.” (Is that the Harvard “we”?) And there are obvious stabs at mimicking fellow Bostonian Alan Lightman—the quirky descriptions of place and light, wildly original comparisons, revealing etymological dissections—that never touch his level of inspiration. Rowing is an obscure, elite sport that could use some exposure for its practitioners. Lambert might have offered that chance, but inexplicably, he fails to ply his obvious talent.